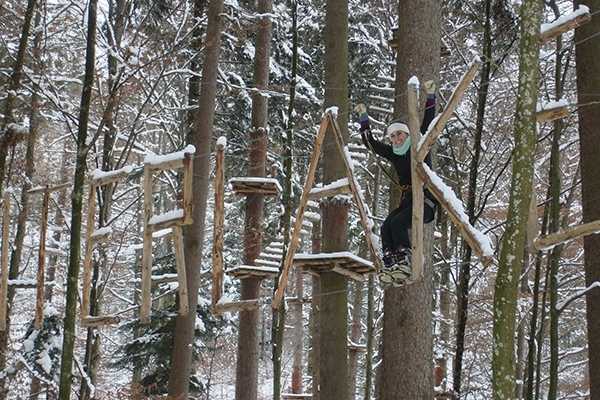 The Adventure Park Interlaken is a winter forest adventure of wooden bridges, tarzan swings and zip lines. Nine courses of varying difficulty and height provide an exciting day out for beginners and adrenaline-seekers, whether individuals, a group of friends or the whole family. More than 120 different challenges from ground level up to 20 meters in height await you. You will be equipped with everything you need and given safety instructions for a fun-filled day with unforgettable memories. Recommended for: Everyone What's Included: Hotel Pick up in Interlaken Seilpark equipment Professional instruction Warm drink Transport What to bring: Warm waterproof winter clothing (available to rent) Good shoes Requirements: Children under 12 must be accompanied by an adult.